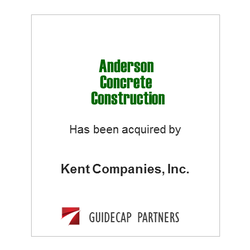 Anderson Concrete Construction of Dallas, Texas has been purchased by Kent Companies of Grand Rapids Michigan. Anderson provides Kent with geographic diversification into the rapidly growing Southern region. ​GuideCap initiated the transaction, acted as financial advisor, and assisted in negotiations for Anderson Concrete Construction.